After my last blog entry, many things happened. My twitter account gained over 30 new followers, and people tweeted at me with both support and criticism. Most importantly, the people over at IslesBlog took notice. They offered me a writing position at the blog, and I accepted it. Don't worry, I'll still be updating this blog as often as I can. With that, I will give you a brief preview of my first blog entry for them. It's a where are they now edition with some of your favorite former Islanders of years past. Rob Schremp: Most Islander fans remember Rob Schremp for the baseball swing goal he scored in Colorado in 2010. Over his parts of two seasons on Long Island, Schremp played in 89 games, netting 47 points. 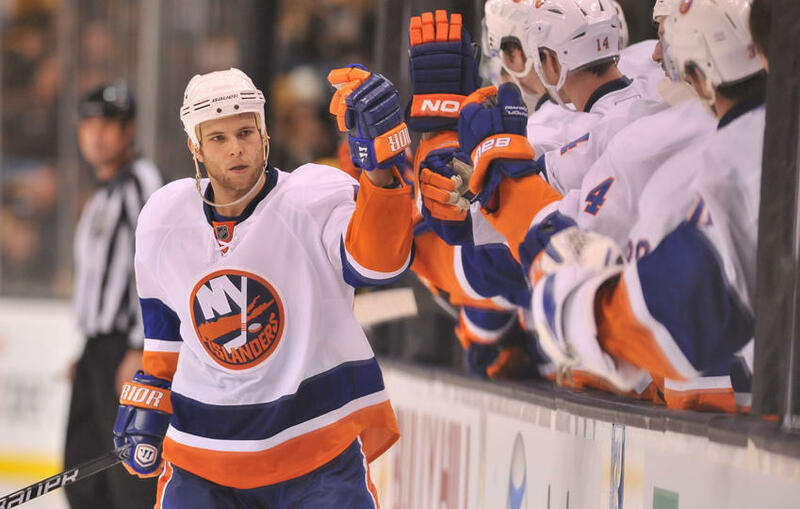 In February 2011, the Islanders placed Schremp on waivers, where the Atlanta Thrashers claimed him. He was a fan favorite during his time on Long Island, and one of the best shootout shooters since Frans Nielsen. He finished out that season with the Thrashes. That turned out to be the last season in Thrashers history, and the last time Schremp played in the NHL. He played a year in the Swedish Elite league, and then went to Russia. He played or Dynamo Riga in the KHL, but left mid-season. He went to Austria for the rest of that season, recording 36 points in 26 games for Salzburg EC. Now, Schremp is playing for EV Zug in the Swiss league. If you have heard of any of these European teams, I envy you. Schremp was once a first round pick, but now he is trying to recapture the dream he achieved briefly playing in the NHL. Slovakian Defenseman Milan Jurcina knocking Team USA's Patrick Kane into the boards. Here's Austrian defenseman and former Islander Thomas Pock, wearing number 22, defending against Team Canada. That's all for this entry. Make sure you check out my IslesBlog entry once it comes out for more! Thanks for reading! Lets Go Islanders! UPDATE: 2/19/14 HERE is the full entry on IslesBlog! Enjoy!